The spectacular Devil’s Slide slice of Highway 1, the Coastside’s sole north-south roadway link opened about 1933, shortly after Prohibition was repealed. This dramatic site where the mountains clash with the Pacific, has served as the backdrop for famous explorers, the failure of a railroad and wild shootouts between bootleggers and rumrunners. Travel writers from the world over have grappled with words to describe the raw beauty before them. Now, as in the 19th & 20th centuries, this savage terrain has even defied the dreams of architects who sought to create lavish homesites. Going back in time to October, 1869, the weary Spanish explorer Gaspar de Portola cast his eyes in the direction of Devil’s Slide (although it was nameless then) when he rested at the beautiful Martini creek campsite– one mile north of the Montara lighthouse on a dirt road east of the highway at the foot of the mountains. 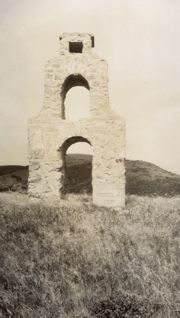 San Francisco publisher and Montara Realty President Harr Wagner erected a monument to Portola on Montara Mountain after San Francisco celebrated the Portola Festival in 1909. A photo of the monument appears in the 1918 edition of “Pacific History Stories”, written by Harr Wagner. 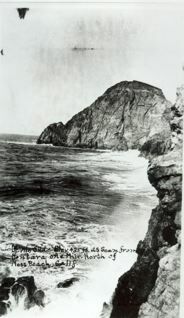 In 1892 a US Geological Survey map identified Devil’s Slide as a jagged rock formation running down the face of the sea. An even earlier map, dated 1881, indicated it might have been called “Striped Rock” because of the streaked (and very beautiful) strata. The road Chase encountered must have been the squiggly Pedro Mountain Road, the road which tightly and steeply wound its way to the crest. It lay east of the railroad tracks which clung to the cliffs and offered passengers thrilling views of ever-changing sea below. When Chase was galloping over the mountain, the Ocean Shore Railroad was occupied with maintaining land that kept slipping into the ocean, interrupting schedules that drained the company’s limited reserves. Eventually, Devil’s Slide became a primary factor in the railroad’s declaration of bankruptcy. During the heady days of Prohibition, the Pedro Mountain Road was the scene of shootouts and hijackings. Steaming, overheated automobiles became a common sight.